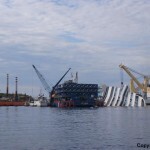 After 18 months lying on it’s side, the Coast Concordia is slowing sinking further into the sea. 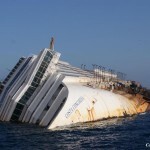 Reports state there is concern the cruise ship may collapse under its own weight. Weakened by the grounding while rust eats away at the steel hull, the vessel has compressed some 3 meters. Recent inspections have found the bow has dropped deeper into the water. 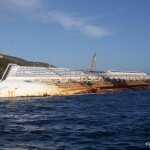 Plans to remove the vessel has been stalled by harsh sea conditions, but the salvage company has announce they would have one chance to pull the vessel upright and float it away sometime mid-September. 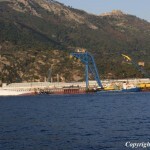 The salvage team would use multiple cranes slowly lifting the Costa Concordia over a 12 hour period. 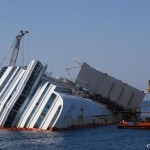 Another note: The salvage operation extracted 96 tons of granite from the 70-meter long gash along the Concordia’s hull.